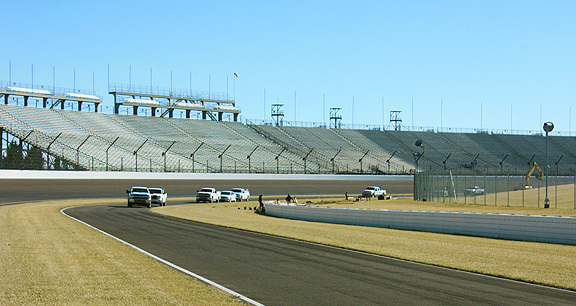 Project obstacles and solutions: The interior safety wall in turn 3 of the Indianapolis Motor Speedway was due to be torn out and rebuilt. The wall serves as the first line of defense when a race car veers off the course. The wall is designed to withstand the impact of a car traveling in excess of 200 mph. Manor Brothers were hired to remove the old wall and replace it. Critical to the impact resistance of the wall was the concrete footing. Most of the structural resistance of the barrier is buried underneath the visible wall. The footing was poured as a 24 x 60 inch moment slab, with a rebar frame construction. The finished wall was then attached to the footing and braced with I-beams. This made one, monolithic wall. Impact panels were placed between the I-beams and the wall. Moment construction is designed to distribute the impact of a crash across the wall. This is the same kind of foundation design you would see in structures where seismic activity is expected. IMI supplied 450 yards of 4,500 psi concrete mix for the moment slabs. IMI QC/QA used a mix design that poured quickly, took minimal screeding to level, and set up quickly. Most of the concrete was poured in cold weather. An accelerating admixture was used in the concrete to achieve a quick set time. For more information about high impact concrete, contact the sales representative for the concrete plant nearest your location. Click here.